Hallowe'en last night was incredibly fun. And of course, our costumes were cuh-razy great! Pics and details will follow tomorrow! Happy All Saints Day! One night last week, I caught an episode of Kimora: Life in the Fab Lane, which centers around the life of Kimora Lee Simmons, a self-professed model, mom and mogul as the head designer of the Baby Phat clothing label. I wanted to like the show. I wanted to like Kimora. I wanted to like her "fabulous" life. But I can't. There's not much likable about it. Or her. Or it. I'm sure that we, as viewers, never really get the true picture of someone's personality during any form of documentary. We are at the mercy of the editors and producers as to how they choose to portray a person. But regardless of how the footage is cut and sliced, Kimora still says the things she says and I haven't been able to like her based on that. I've heard her contradict herself a few too many times. In one episode, she embarassed an assistant by stating that the assistant's toenail colour didn't match the open-toe shoes the assistant was wearing. In the next episode, Kimora was commenting on a reporter's fingernail polish and how anyone should be able to wear any colour they want, because the colour is for yourself and no one else. Just this example makes me think that Kimora is either being dishonest in her opinions or she's just being mean. Either way, it doesn't attract me to her. The age old story of a woman overcompensating and trying to "have it all" is hackneyed. We've been seeing it played out on TV, in movies, and even in songs for the past 50 years. No man has ever gotten to where he is by himself, so I'm not really sure why women are trying to prove they can do it all alone. Of course men get help along the way; they just don't talk about it. And the Kimora's of the world - and there are many - need to realize that. Kimora is not likable. And I find myself rooting more for her failure than for her success. Like I said, we take it seriously. So stay tuned for pics of his limitless creativity for this year. All I can say is - it's a a thriller! And have a safe, happy and most of all fun Hallowe'en!! A wondrous product that reduces the look of fine lines and dark spots on the skin . . . or so they claim. Do women really buy this? Both literally and figuratively, I mean. Surely women understand that the final look on this model is not achieved without great lighting, good photography, and tons of makeup. Surely they do. While I was home visiting the folks, I sat up late one night watching TV and caught several episodes of Ninja Warrior. I've never found this on Chicago cable, but if I ever do, I'll be addicted. It’s a physical challenge so grueling, requiring such extremes of strength, speed, balance and agility, that while more than 1,400 have attempted it, only one human has ever completed the entire course: Kazuhiko Akiyama, a crab fisherman turned medical clinic superintendent. The competitors in Ninja Warrior (also known as Sasuke) hail from three continents and represent a surprising variety of disciplines. They include U.S. Olympic gymnasts Paul and Morgan Hamm, who took home gold and silver medals at the 2004 Athens games; Bulgarian gymnast Jordan Jovtchev, who won silver and bronze medals at the Athens games; and several Japanese competitors whose day jobs range from fireman to steel worker to gas station supervisor to comedian. One competitor is billed as the world's toughest transexual. It's fun, it's tough, and it's Japanese TV. What's not to love? Also on Manhunt was John, who was also Janice Dickinson's top model on her show, The Janice Dickinson Modeling Agency (at least he's sticking to what he knows). And seeing as how Gay, Straight or Taken? is the proverbial springboard to everything else, Episode #1 contestant Mike was also a contestant on CBS's Big Brother 6. Another one of Janice's models, TJ, bears a striking resemblance to a contestant right now on America's Most Smartest Model, although he seems to have changed his first name from TJ to VJ and his last name from Wilk to Logan and has recreated his past. Ok, they might not be the same, but they sure do look a lot alike. So back to Buddha. Clearly he is not on I Love New York; Season 2 to truly win New York's heart, if in fact she even wants it won. Buddha, or Ezra, is out to be famous - just like all the other contestants on all the other shows. It's not about getting a partner, winning a race, losing weight or anything else. It's all about the money and the exposure. Which, in and of itself, is perfectly fine. But can't the people who cast these shows do a little research and at least give us new contestants so we aren't looking at the same fame-hungry, egocentric people all the time?? Maybe I just watch too much television. On Saturday, I caught "Legally Blonde, The Musical" on MTV. While it postponed everything I had already planned to do, it was a guilty pleasure. And while I felt like I was saving myself $100 by not buying a ticket, it reminded me how much I love live theatre and the experiences and feelings that go along with sitting in an audience and being taken on a fantasy trip. I think Broadway and television should get together and do this more often. For many people, attending a Broadway show is completely beyond their grasp: the cost of the show ticket, plus the costs of a hotel stay and a flight to New York - well, that's about $1,000 right there. Now and then "they" say Broadway is dying. But think of the billions of kids who are never exposed to it. Things like what MTV did this past weekend would introduce Broadway and the theatre arts to all those who believe its out of their reach, perhaps sparking interest and desire in pursuit of something that was thought unattainable. I could have done without the commentary from the three vapid girls from the O.C. or whatever pointless show they are on, but hats off to MTV for a job well done. To understand what this blog entry is all about, click here. 2006 - Watch Part 2 of the Project Runway finale with The BF and Jessica. 2005 - Meet Lindsay at Blue Man Group. Have lunch with friend David C. at Joy's. 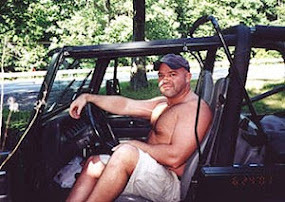 2004 - Rehoboth Beach Trip with Ex#5. Shop the Outlets. Have dinner at DIK's in DC. Drinks at Tom-Tom. 2003 - Flag football with friends. See "Kill Bill" with Ex#4. 2002 - See "Sweet Home Alabama" at Union Station in DC. Clean bedroom. 2000 - Pick up design package from Gallup. Dinner with friend Paul E.
1999 - Shop at Target. 1998 - Visit parents for the weekend. Buy new stove for parents at Sears. 1997 - Walk around Union Station with Ex#3. Go to Badlands with friend David F.
1996 - New Flow arrives in Gap store. Work 8-5. Date with Rick at 7:30. 1994 - Eye appointment at 4:30 at Hour Eyes. 1993 - Brunch with friend Micheal. Walk through downtown Winchester with classmate Colleen I. 1992 - On Fall Break at school with Ex#2, stay at Will O' The Wisp at Deep Creek Lake. Dinner at the Casselman. Play ping pong and swim. 1991 - Pizza Hut with Ex#2, Corey, Micheal, and BJ at school. 1990 - Visit corporate office in Beltsville, MD. Go out to Rascals in DC with friends Glenn and Jim. 1988 - Work at Ticor Realty Tax Service during the day in Annandale, then 6-9:30 at Accessory Lady at Tyson's II - The Galleria. 1986 - Work at Braddock Motor Inn from 5-10. 1985 - Work 2-9:45 at Camelot Music. 1982 - Babysit the 5 Sivic children. Who the hell do taxicab drivers talk to all day long while they are driving their cabs? The other day, I took a cab ride from The Loop to Lakeview - ended up being a 20 minute cab ride thanks to traffic - and the driver never stopped talking, in a foreign language of course. At first I was thrown because I thought he was talking to me and I kept saying, "I'm sorry?" and "excuse me?" Then I realized he had his bluetooth hooked in. I don't take taxicabs very often. Unless I am leaving the office after a 12-hour day, or it's really late at night and I just want to get home fast, I tend to use the bus and the "L" to get where I need to go. It's not because I am cheap and don't like paying the fare (ok, well that is part of it), but lately I don't like the fact that I have very little say in my personal safety when it comes to being at the mercy of someone who may or may not be an actual licensed driver. Your cab driver is licensed and trained to treat you with respect and courtesy. You are to travel in a clean, comfortable and safe vehicle. The most direct route or the route you request should be taken to your destination. A receipt should be provided upon request. Your driver must obey all traffic laws. Heat or air conditioning should be turned on/off at your request. You can travel without the radio being on. Smoking in the vehicle is prohibited. Please promptly pay your fare when reaching your destination. For your safety please use the curbside door to exit the cab. Please treat your driver with respect and courtesy. Cell phone use by the driver while operating the cab is prohibited except in emergencies. For your safety please use your seat belt. Please remember to take all your belongings. Granted these are the rules for Yellow Cab (which also manages Wolley Cab and Checker), but not all taxicab companies in the city, including the other two big ones, Chicago Cab and American-United. But you better believe the next time I am in a taxicab and the driver is talking to someone who is not in the cab with me, I'm requesting he hang up and concentrate on the street, the traffic, the pedestrians, and the cyclists. A driver may only use the horn when necessary to warn of danger. Then I'll be happy. For now. Kindertransport is the name given to the rescue mission that took place nine months prior to the outbreak of World War II. The United Kingdom took in nearly 10,000 predominantly Jewish children from Nazi Germany, and the occupied territories of Austria, Czechoslovakia, and the Free City of Danzig. The children were placed in British foster homes, hostels, and farms. People taking in refugee children and feeding, clothing and providing shelter for them with no retribution and little reimbursement. Do you think something like that is happening in the Middle East? Some saintly person is risking his reputation and possibly his life, thinking only of the children and the possible hope for the future of his country and the sanctity of family? Someone who hopes beyond hope that the next generation will learn lessons from this generation, just as they did in 1940? I doubt it. The world is not as kind as it was. Sportscasters as a group are the most inane people in media with incessant banalities being passed off as "insightful commentary." But toss a woman into the mix and no matter how enthused or spontaneous she might sound, she still comes off as though she's reading from a teleprompter. And, in a way, women broadcasting sports sorta pisses me off. Somehow, they seem like they are horning in on someone else's territory. I don't think it's absolutely necessary for both sexes to share everything. I mean, I'll never know what it feels like to give birth, so women shouldn't know what it feels like to tell me about a trap play or a sweep. Men and women should be allowed to have different clubs without fear of the other one wanting a piece of it. When is this theme ever going to die? Confirmed bachelor(ette)'s life gets turned upside down by the sudden addition of precocious 7 year-old child who teaches about love and responsibility. This theme dates back to the days of Shirley Temple, and probably even further than that. I personally don't know any single person who's life was changed for the better with the sudden responsibility of taking care of child. Seriously. None. If those kids wound up on my doorstep, I would farm them out faster than you can say "Santa Claus ain't real," and go back to watching TV in my underwear. Nearly 500 school children in Fugong, Yunnan Province, China have to cross the often raging Nujiang River each day to get to school. The only problem is that there is no bridge. In order to cross the river, the children have to take the journey via a single steel cable stretched across the canyon. Children as young as 4 years old have to transverse the river by themselves each day. The children fasten themselves to the cable with a carabiner and a rope to slide over the 200 meter wide canyon. Occasionally children get stuck in the middle of the cable and have to wait up to half an hour in order to be rescued. Officials finally agreed to spend the $35,000 to build a bridge after a TV program drew attention to the dangerous situation. For the past 4 years, he's been killing our adults. But why stop there? Get them while they're young, W! How can you take an expanded health insurance program away from children? It's apparently not enough that he's been sending young men and women to their deaths in a war that doesn't mean anything; now he wants to stop a bill that would expand healthcare for US children. And he did it in his usual sneaky fashion: behind closed doors at the White House with no press coverage, which should have been huge considering this was only the 4th Veto of his entire appointment presidency. What where the other three vetoes? Yes, yes. This is the compassionate conservative YOU people elected, and then re-elected. Be proud of yourselves, America. Well, it's happened again - my deodorant has stopped working. Almost like clockwork, every 18 months or so, I have to go shopping for a new deodorant because mine suddenly stops working. It apparently takes my body a year and a half to figure out the code in each deodorant just enough to render it useless. And that time has come again. I've used Speed Stick, Dry Idea, Arrid, Degree, Sure, Ban, Gillette and Right Guard (I prefer gels over sprays and solids). For the past 18 months, I've been using Mitchum. What attracted me most to it is the fact that it is unscented. I prefer not smelling too perfumey - not because I am all into the "man smell" (quite the contrary - I love the smell of soap on clean skin), but I just don't want too many smells on my body at once. It's the main reason I never wear cologne or after shave (but that's a whole other blog). So now it looks like it's on to Tom's, Arm & Hammer or perhaps (sigh) Old Spice. At least for the next 18 months.